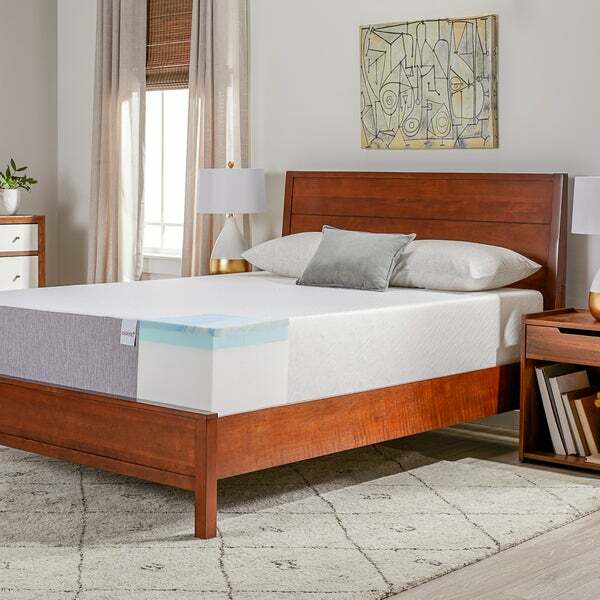 This marvelously constructed medium firm 12-inch gel memory foam mattress is designed to give you the deepest, most relaxing night's sleep available. A careful arrangement of three distinctly functional memory foam layers combines to provide plush comfort and uncompromising support that relieves pressure points and keeps joints at ease. Uniquely comfortable, this excellent mattress helps keep your spine aligned while facilitating head dispersal and minimizing motion transfer. Like many people on here, I spent a lot of time reading reviews, comparing features, and trying mattresses at local stores. The ones in the stores were nice, had warranties, and you could try before you buy. But they were 3 to four times the price, so we decided it was worth the savings to go with one at Overstock.com. Our first criteria was made in USA, figuring this would ensure the mattress met US safety standards and have less toxic additives in the foam. Secondly, the ones we liked the best in the stores had gel-infused memory foam, so we looked for that feature as well. The mattress arrived within just a few days of ordering, and we unrolled it and let it expand fully for 2 days before using it. I was happy to see a US factory's address on the one sticker on the packing; it seems like they make memory foam mattresses for a number of "off-brands". The smell wasn't horrible, but our kids could smell it more than us. We left the windows open in the room to help it air out, but the smell was mostly gone within a week. Sleeping on it has been nice. The gel-memory foam top is soft enough to let your elbows, hips, knees, sink in comfortably, yet the base foam is firm enough to support us so we don't feel entrapped. (I'm 6', under 200#). We can sleep comfortably on our backs or sides. I was a little leery of it only having 1" of memory foam on it (the rest is just standard foam) but after a few nights of sleeping on it we're very happy with the purchase, considering the price. I'm not giving it 5 stars because it comes with no warranty, and I can't attest to the longevity of it. Only time will tell. My wife and I slept for years on a poor mattress because we loathed the mattress buying process. This mattress costs less than half what you would pay for similar quality in a "discount" store. It was delivered in two days. Since it was a Christmas gift to each other, it stayed in the box for two weeks until Christmas day when we unboxed it and watched it grow to full size over the course of about two (very cool to watch) minutes. It outgassed mildly all day, we made the bed 11 hours after unpacking and slept on it the first night and most nights since. Memory foam is a completely different experience than a spring mattress. This particular mattress is very firm despite the name but both of us find it very comfortable. We have had it for about a month and our backs feel so much better in the morning. I waited to write this review to make sure we had enough experience behind it. I am confident the mattress will last longer, but even if it only lasts 5-10 years, I'd buy another. Excellent product, excellent shopping experience. Why go anywhere else.? Excellent mattress...No groggy sleep hangover! I have to say that the way this mattress was shipped made me wonder if I'd made the right choice. I wondered how on earth that small box could produce a decent mattress (or anything else for that matter). HOWEVER...To watch this thing from outer space expand to full size was quite interesting. You should have seen us trying to get it on the box springs fast enough! A comedy re-run! LOL...Don't try this at home alone! Okay, so I waited all day to see how the mattress expanded and low and behold, it is actually quite large! I got one of the best night's sleep in a very long time... The second night was even better! This is everything I hoped it would be. It's been 5 days now and I am completely SOLD! I wake up refreshed (although I could stay in bed all day) with no groggy sleep hangover at all. I've seen where some folks worry about getting too hot at night and I am in that stage of life right now...no issues here. The description says medium firm and I'm glad that's what I chose. Any firmer and I don't think it would be as comfortable...it's pretty firm. For those who have complained about the mattress sagging in the middle after some time, I would suggest getting a nice box springs for long term support. That's what I did. (Priage 9-inch Smart Box Spring Mattress Foundation) If you are on the fence between this and a pillow top...I'd pick this one hands down!...Happy dreams! Yes, what took me so long to finally make the switch to this foam memory mattress! So worth it. I wished that I made the decision to get it a little firmer, and not follow the major suggestions of getting it medium firm, but it is not a big deal. Is just a matter of getting used to from the old standard spring mattresses. All in all I have been very happy with several products sourced through Overstock.com. The one problem I had with a different product Overstock handled the customer service extremely well. I purchased three mattresses; one queen and two twins and I am very pleased with the products. I know, I sound over the top, and no, I'm not compensated for my opinion. I paid full price, minus a coupon for 10% off for buying with store card.. but would have paid twice that to get the comfort and ability to get the sleep this mattress is giving me. I have a titanium rod in my leg from hip to knee and on my old mattress toss and turn to get comfortable enough to sleep all night long. Not so with this mattress. I'm not the only one. I allowed my 17 year old dog, who has hip displasia since birth, and she normally is wakened at the first sign of movement on my old mattress. I can get up and crawl back into bed, and she doesn't even notice and she is so much more lively and is excited to go on our morning walks, and walks much further after a night on this mattress... Therefore I want to give it 5 more stars for her! Unfortunately she can't write her own review, otherwise you'd have another documented fan! Thanks for improving both our lives! This mattress is amazing! This was my first foray into the world of memory foam mattresses after having used a traditional spring mattress for my entire life. Sleeping on a spring mattress always left me feeling fatigued and achy upon waking, but those problems have resolved with this mattress. Now my biggest problem is the fact that I don't want to get out of bed in the morning because I'm so comfortable. I was a little wary of buying a mattress without being able to lie on it first, but this was a solid buy. Similar mattresses cost two and three times as much at the local mattress store. My only complaint would be the smell. When we first took the mattress from its packaging, we let it air out per the instructions, but there was still a very strong smell coming from the foam, which ended up filling our whole house. Unfortunately, since we got it during the winter, we didn't have the option of opening the windows to speed the airing out process. We've now had the mattress for three weeks, and the smell is almost gone. Overall, I would highly recommend this mattress to anyone. this mattress was just as described- it was a full 12 inches high, and we did not need to get a separate box spring for our platform guest bed. the mattress is firm, but soft enough to contour to your body. If you like a soft pillow mattress, this is not for you- but it also is not rock hard like some spring mattresses we looked at in stores. it looks much more expensive than what we paid for it! 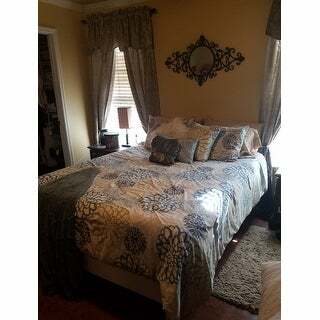 it fits well on the queen size frame and had no offensive odor. We literally cut the plastic and it unrolled right onto the bed- it even inflated right away. it looks really nice! You can't beat that price, but I wouldn't advertise it as Medium Firm. Unless Medium Firm is another way of saying soft and squishy. Words are not enough to describe the comfort of a memory foam mattress. Arrived quickly, easy to open. Expanded to it's full size in 24 hours as indicated. Comfortable. Perfect for my spare room. Fantastic mattress. Everytime we have a guest sleep over they tell us that they have had the best night of sleep in years. I would highly recommend purchasing this mattress. Worth the cost! Don't hesitate to purchase. Awesome and so relaxing!!!!!! My daughter loves it!!!! It’s a good buy for the price. I just received today so It hasn’t been slept on. It feels like a typical memory foam. It’s vacuumed pack which is actually not bad. This is the second “bed in a box” I’ve gotten from Overstock and I’m not disappointed. Good price good quality. Instead of paying $2000 + , I prefer paying less and replacing mattress every few years. 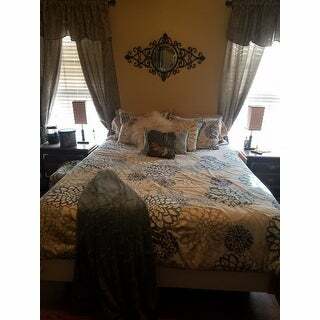 Works great for guest bedroom where usage is less. "Can the mattress be used on an adjustable bed?" Yes, this mattress can be used on an adjustable bed base. "Is this TEMPERATURE REGULATED GEL FOAM MATTRESS?" All memory foams, including gel memory foam, will soften slightly as the temperature increases and become firmer as the temperature decreases. Gel memory foam does help to draw heat away from the sleeper so that they sleep cooler. There are specialty foams and fabrics in the marketplace that work specifically to maintain a regulated environment, drawing heat from the sleeper when it’s warm, and releasing the heat as the environment cools at night. The Select Luxury mattress you are referencing does not contain this type of foam. "Is this a good mattress if you are on the heavy side ?" "Is the cover removable? does it have a layer between the cover and mattress? What are the materials in the layer? Thank you!" No the cover is not removeable. "Can you sleep on this immediately"
Yes, you can sleep on the mattress immediately. However, please keep in mind that it could take up to 72 hours for the mattress to fully expand. "Does this mattress come with a foundation or box spring for under the bed?" No it does not. Mattress only. However, we are very happy with this mattress. "How can a queen size mattress be :Dimensions are H: 15 W: 15 L: 63?? Please advise the dimensions again for Queen Mattress in Inches please." The mattress dimensions are 12 x 60 x 80. However, when the mattress is compressed and rolled for shipping, it is put into a 15 x 15 x 63 Master Carton.